We keep showing a collection of web applications especially conceived for Real Estate and interior design professionals who should rather have such ones in their websites. 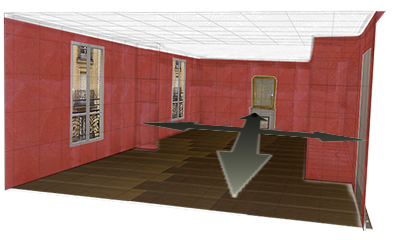 The last 3d application were not really a virtual tour, here it is an authentic one with a real 3d space where it is possible to move with the arrows of the keyboard. The interactivity is very simple: to move into the room, just use the keyboard’s arrows, as if you were driving an invisible vehicle. The room is the same one you have seen last month in our chronicle, the 3d object is therefore exactly the same one. The difference concerns the interactivity, the possibility to move into a 3d space. The room’s rotation appeared from a fixed point of view outside from the room. There, the visitor’s point of view changes as he moves inside the room.